Boshiho Denim Jean Work Apron, tool apron, shop apron with pockets, utility apron, shop apron for carpenters, working apron, woodworkers, woodshop, workshop, garage, mechanics, machinists, lathe work, tattoo artists, barbers, bartenders, leatherwork, metalwork, light welding, metalsmith, blacksmiths, gunsmith, crafts, baristas, butchers, brewers, painters, art teachers, men's apron, woodworking tools, gardeners, master technicians, ski shop, etc. Unique gift for men, women, mothers, fathers. -Please allow 0.4-1.2inch error.And there may be a little color difference due to different computer display. -There may be a bit smell of leather when you get this notebook since it's unused. You could open the package and put it in a ventilated place for a few hours and the smell will fade away. -There may be a little color difference due to different computer display. 【Heavy Duty Denim Jean Work Apron】Made of strong, durable thick denim jean ; superior stitching; thick top and bottom hems. 【Adjustable and Comfort Neck Strap Bib Apron】Cross-back straps go over the shoulders rather than around the neck to better distribute weight to prevent neck pain. You will feel comfort to wear this work apron. 【Utility Apron with Multiple Pockets】8 front divisional pouch pockets, 2 chest pocket, storing your phone and parts and the tools in the pockets. 【Large Apron Fits Both Men and Women】 Measures 29.5 inches wide x 23.6 inches tall (75cm x 60cm). The waist strap is 22.8 inches. 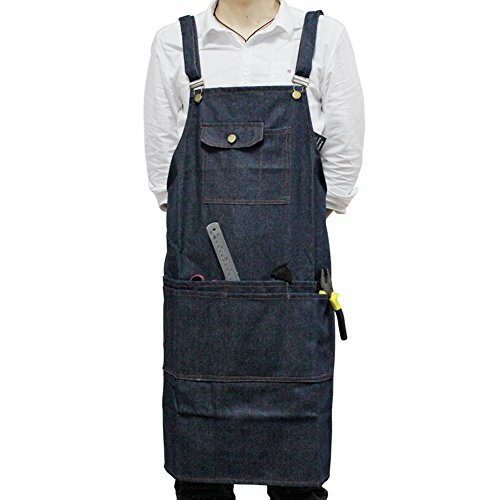 【Most Widely Used Workshop Tool Apron】Ideal for woodworkers, woodshop, workshop, garage, mechanics, machinists, lathe work, tattoo artists, barbers, bartenders, leatherwork, metalwork, light welding, metalsmith, blacksmiths, gunsmith, crafts, baristas, butchers, brewers, painters, art teachers, men's apron, woodworking tools, gardeners, master technicians, ski shop, etc. Unique gift for men, women, mothers, fathers. If you have any questions about this product by boshiho, contact us by completing and submitting the form below. If you are looking for a specif part number, please include it with your message.